14 best-selling solos from The National Federation of Music Clubs bulletin are compiled under one cover. These titles provide motivation for students, and ideal repertoire for performance. Titles include: Cheerful Chimes; The Llama; Mr. Cat; Ogg (The Caveman); Spirit of the Stallion; Circus Tumblers; Crazy Cars and many more! 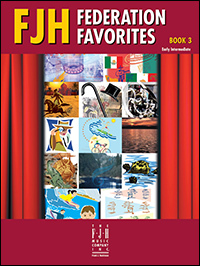 This fun supplemental book offers a variety of styles from FJH’s leading composers. This collection of 13 solo sheets from The National Federation of Music Clubs bulletins features great educational writing by a variety of FJH composers. Jazzy! ; Mischievous Monkeys; Diamonds in the Sky; Ghost Waltz; Loco-Motive; Little Cloud; Last Star; and Thundering Drums are a few of the selections in this collection that provide superb supplemental material for lessons, recitals or just for fun! This collection has 13 early intermediate solos selected by The National Federation of Music Clubs featuring popular FJH composers Timothy Brown, Edwin McLean, Jeanne Costello, Martin Cuéller, Christopher Goldston, Stephanie J. Wilburn, Lucy W. Warren, and others. Titles include: By the Brook, Sea Otter Slide, Jumping the Hurdles, Secret Agent Boogie, The Sultan’s Ride and Boogie Boardin’. Features 13 original compositions by Melody Bober, Kevin Costley, Kevin Olson, Mary Leaf, Nancy Lau and others that were chosen for The National Federation of Music Clubs bulletins. These exciting early intermediate/intermediate selections are perfect performance pieces for recitals or auditions. Waltz of the Vampires, Raging Storm, Navajo Legend, Sailing the Coral Sea, Mighty Eagle, Tarentella Viva! and more.